The German festival, Deutschland Fest 2018, will be held at Ly Thai To Monument in Hanoi on November 2 and 3. The latest Deutschland Fest in Vietnam was held three years ago. 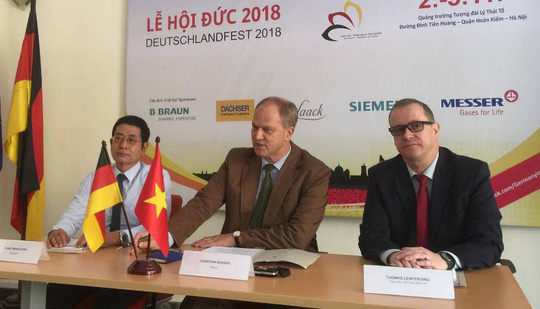 On October 30, German Ambassador to Vietnam Christian Berger said at a press conference he was happy that the festival was being organised again. According to Berger, the management board have worked hard and come up with a varied programme for the visitors. Nearly 40 German firms and organisations will participate in the festival to introduce about themselves, showing a rich relationship between the two countries. Head of the Consular and Cultural section at the German Embassy, Thomas Lenferding, also said the festival organisation board received a huge support from German firms and organisations. He felt honoured to be able to hold the festival at Ly Thai To Monument in the coming weekends. The festival will have free admission. One of the highlights of the festival is the performance on November 3 by the rock band Isolation Berlin, fashion show by Van Laack, introduction to the Brothers Grimm Beer and many other activities. This is also a chance for Vietnamese people to understand more about German culture, opportunities to study overseas and the works of German firms in Vietnam.